Designed to provide a highly visible warning of exposed high voltage cables. It has a sand ball.. Designed to provide a highly visible warning of a damaged Keep Left bollard. It has a sand ball.. 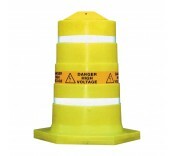 Designed to provide a highly visible warning over exposed Live Cables. It has a sand ballasted ..